When it comes to jailbreak tweaks and apps, there are a few names, that when mentioned, instantly make you think of quality. IntelliBorn may come to mind, Ryan Petrich certainly deserves a nod, and of course you can’t forget about folks like chpwn and Aaron Ash. Obviously, there are a few others who are worthy of being included in the same conversation, including SBCoders — a developer that has recently created a significant amount of high quality tweaks. Dash is a tweak that allows you to easily switch between running apps on your iPhone or iPad, using simple swipe gestures. Instead of the typical app switcher found on stock iOS, Dash utilizes a full screen view and displays the full contents of each app window. This allows you to easily discern what the app is about, what it currently contains, and whether or not you want to switch to it. 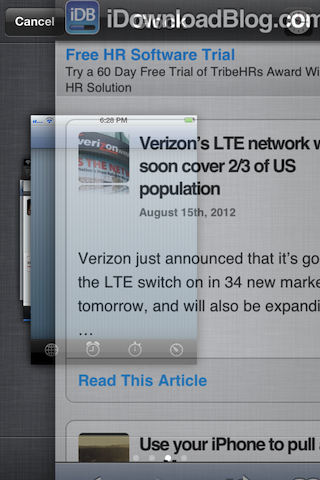 You can also close an app out completely with a swipe up gesture. While the concept of Dash is a radical departure from what you normally experience when switching apps in iOS, the look and feel of the tweak retains many of the same familiar visual cues and methodology. 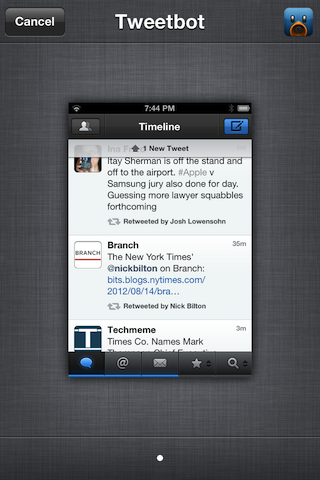 This enables the tweak to have a native feel — more of an natural progression and extension of the current app switcher. The linen background is prominently featured when invoking Dash, as are familiar elements such as the page dots at the bottom of the screen, and the choice of font. It all makes for a different, yet intuitive experience, which you’ll most likely enjoy. 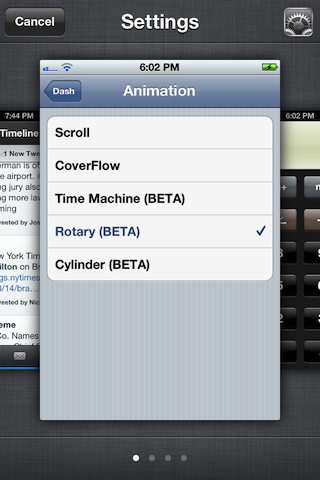 Animations are the predominant feature found in Dash. As a matter of fact, outside of a panel that allows you to select the Activator action used to invoke Dash, animations are the only other options to be found within the tweak’s settings. As of this writing, there are five different animations that you can choose from. 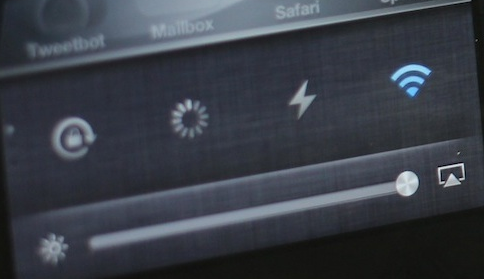 There’s Scroll — a simple scroll left or right between running apps. CoverFlow — the Music app album art inspired method. Time Machine — for those familiar with Time Machine on OS X, or Versions on OS X Lion or Mountain Lion, then you’ll know what to expect here. Lastly you have Rotary, and Cylinder — and from their respective names, I’m betting you can figure out how each of these work on your own. Although the animations do add a stylized feeling to switching between apps, the whole point of Dash is to provide a more informed view of the running apps, while still feeling like a native iOS experience. 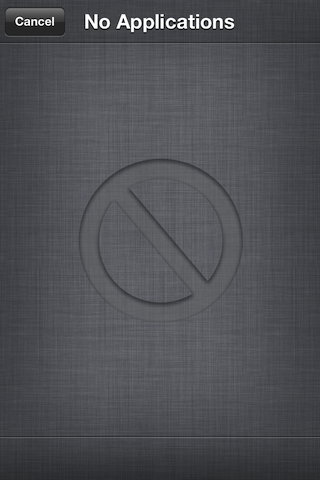 Even though the tweak is in beta, I think that the SBCoders have succeeded in meeting this goal. Granted, all of the animations aren’t 100% smooth, and there is a slight delay when invoking the app switcher, but if previous tweaks are any indication, I’d say we can expect a solid product come release day. If you want to try Dash for yourself, then stay tuned. It’s not out yet, as the developer is still tying up a few loose ends, such as adding media controls, and optimizing the tweak for both the iPhone and iPad. 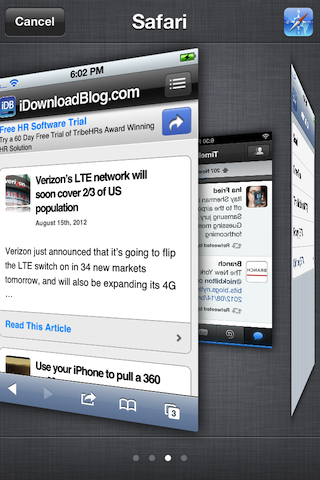 The good news is that the developer says there won’t be a long delay before it is officially released on Cydia. What do you think? Does Dash sound like a winner to you?